We’d love your help. 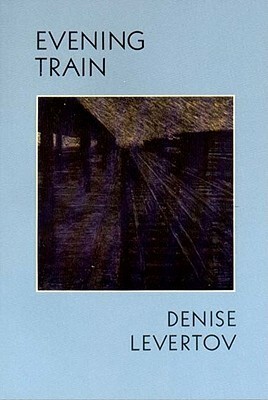 Let us know what’s wrong with this preview of Evening Train by Denise Levertov. To ask other readers questions about Evening Train, please sign up. "It's against the rules to tell your own fortune,/and I, after all, am able only to descry/the images in the leaves, not to construe their meaning." from "Letter to a Friend"
"All my life hoping: having to hope/because decades brought no reassurances." from "Hoping"
"the heron, unseen for weeks, came flying/widewinged toward me, settled/just offshore on his post,/took up his vigil./ If you ask/why this cleared a fog from my spirit,/I have no answer." "like any mortal hero out of his "It's against the rules to tell your own fortune,/and I, after all, am able only to descry/the images in the leaves, not to construe their meaning." from "Letter to a Friend"
"like any mortal hero out of his depth,/like anyone who has taken a step too far/and wants herself back." from "Salvator Mundi: Via Crucis"
Larry Smith Well there is that quiet sharing here in this older modern poet. Levertov kept her spirit open and free and yet deeply reflective. She moves so smoothly along trails and streets and opens eye and heart. Title poem is so disarmingly charming. Here are a few lines: "Blue smoke from small/ peaceable hearths ascending/ without resistance in luminous/ evening air." I love Levertov, and I absolutely love this collection of poetry. Some of it is written during her time in the NW . . . it is timeless, beautiful, and speaks to my soul. Denise Levertov was born in Ilford, Essex, England. Her mother, Beatrice Spooner-Jones Levertoff, was Welsh. Her father, Paul Levertoff, immigrated to England from Germany, was a Russian Hassidic Jew who, after converting to Christianity, became an Anglican parson. At the age of 12, she sent some of her poems to T. S. Eliot, who replied with a two-page letter of encouragement. In 1940, when she wa Denise Levertov was born in Ilford, Essex, England. Her mother, Beatrice Spooner-Jones Levertoff, was Welsh. Her father, Paul Levertoff, immigrated to England from Germany, was a Russian Hassidic Jew who, after converting to Christianity, became an Anglican parson. At the age of 12, she sent some of her poems to T. S. Eliot, who replied with a two-page letter of encouragement. In 1940, when she was 17, Levertov published her first poem. During the Blitz, Levertov served in London as a civilian nurse. Her first book, The Double Image, was published six years later. In 1947 she married American writer Mitchell Goodman and moved with him to the United States in the following year. Although Levertov and Goodman would eventually divorce, they had a son, Nickolai, and lived mainly in New York City, summering in Maine. In 1955, she became a naturalized American citizen. During the 1960s and 70s, Levertov became much more politically active in her life and work. As poetry editor for The Nation, she was able to support and publish the work of feminist and other leftist activist poets. The Vietnam War was an especially important focus of her poetry, which often tried to weave together the personal and political, as in her poem "The Sorrow Dance," which speaks of her sister's death. Also in response to the Vietnam War, Levertov joined the War Resister’s League. Much of the latter part of Levertov’s life was spent in education. After moving to Massachusetts, Levertov taught at Brandeis University, MIT and Tufts University. On the West Coast, she had a part-time teaching stint at the University of Washington and for 11 years (1982-1993) held a full professorship at Stanford University. In 1984 she received a Litt. D. from Bates College. After retiring from teaching, she traveled for a year doing poetry readings in the U.S. and England. In 1997, Denise Levertov died at the age of 74 from complications due to lymphoma. She was buried at Lake View Cemetery in Seattle, Washington.